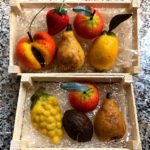 Frutta Martorana is a typical Sicilian sweet which has the same shape of a real fruit, a vegetable, or other type of food. It is mainly prepared during the All Saints’ Day, although you can buy it during the entire month of November and the month of December. To prepare this dessert you have to use sweet and bitter almonds flour and sugar. Generally the Sicilian bakeries use a mixture of almonds and sugar according to a 1: 1 ratio (that is 1 kg of almond flour and 1 kg of sugar). I chose to do the opposite in fact I use less sugar so the fruits aren’t too sweet. Usually I prepare the almond flour at home; though it is not as refined as that one you find on the market, but I can guarantee you that it is equally good and it is especially genuine. To do the almonds flour it will be necessary shell the almonds, blanch them for about 3 minutes, drain, cool them and remove their skins. Then you can allow them to dry at room temperature for a few hours or in the oven at 180 ° for about 10 minutes. Before chop finely, you’ll have to cool them, otherwise you will get a “almond paste” and not a flour. The process of creation of the fruit is very long, but at the same time it is simple. 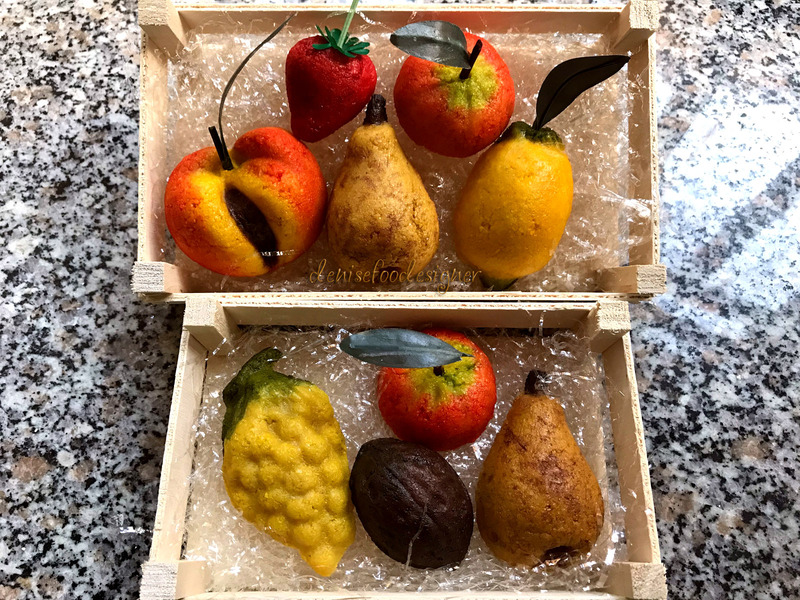 In my opinion the only “critical” phase it’s the coloring of the sweets, because you have to mix colors well to get one which is as similar as possible to that one of the real fruit. You will look like the artists! I believe that nothing makes you feel better when creating a dish! Dilute the essences in mineral water, stir and set aside. Arrange the flour and sugar on a worktop. Mix both ingredients and add the water slowly. So you begin to knead. At first the mixture is a little sticky, but during the operation it will take a firm texture. It will be necessary to work it until it becomes dry. Then form an elongated dough and let it rest for about 10-15 minutes. During this time of rest, almonds release their oil. After this time, you can start cutting the dough into slices which must be 1 cm thick. Then you have to work these small portions of dough into balls. Now you can proceed in two ways: cover the special molds with the plastic wrap or sprinkle the same molds with icing sugar. Both steps will prevent the dough sticks to the mold. You have to press the dough well and let it adhere to the mold, after remove excess dough and flip your fruit; so place it on a different worktop and let it dry. The fruits should dry for at least 12 hours. When their surface will be matte and they will become quite hard, you can proceed with the coloring. You can dilute the colors with water or food alcohol (used to make liqueurs), paint your creations and let they dry again for at least 12-15 hours. When they will be ready, you’ll have to sprinkle them with the arabic gum for food, using a brush. The gum will dry in about 2-3 hours. Now your fruits are ready to be enjoyed!